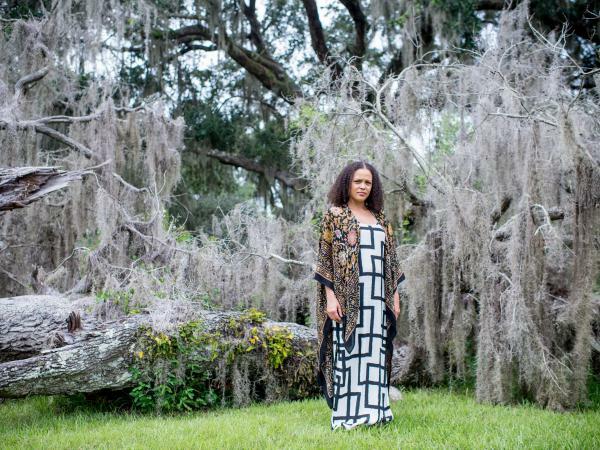 Jesmyn Ward poses for a portrait near DeLisle Bayou in DeLisle, Miss. Ward, 40, has chosen to return to DeLisle and raise her children there, despite her profound ambivalence about what the town represents. (Left) Jesmyn Ward, left, talks with her uncles in the house where she grew up. (Right) Jesmyn Ward and her grandmother. Patrons visit Pass Books, the bookstore in Pass Christian, Miss. Jesmyn Ward poses for a portrait outside her great-grandmother's house in Pass Christian, Miss. 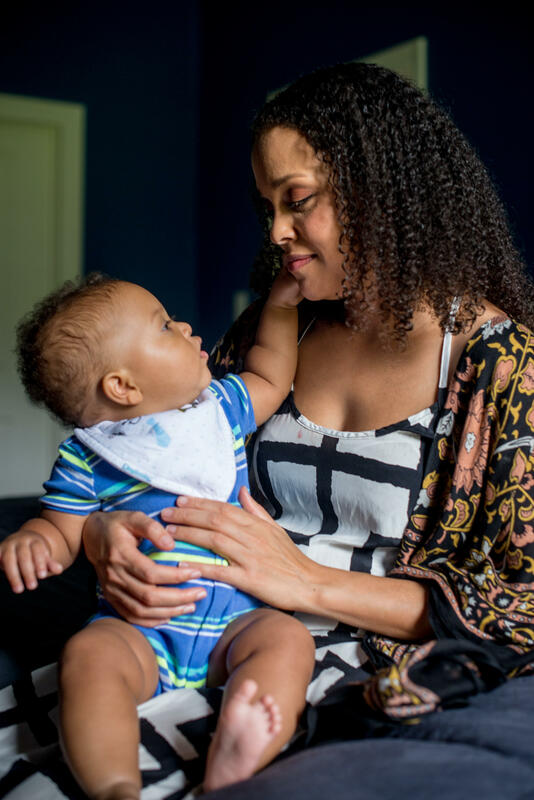 Jesmyn Ward shares a moment with her 10-month-old son, Brando. For writer Jesmyn Ward, Mississippi is a place she loves and hates all at once. She grew up and still lives in the tiny town of DeLisle, Miss., close by the Gulf Coast, where, she writes, African-American families like hers are "pinioned beneath poverty and history and racism." Those struggles, hinging on race and class, run all through her writing, from her novel Salvage the Bones, which won Ward a National Book Award in 2011; to her searing memoir Men We Reaped, published in 2013; to her new novel, Sing, Unburied, Sing. Ward, 40, has chosen to return to DeLisle and raise her children there, despite her profound ambivalence about what the town represents. On the one hand, "there's a feeling of belonging and of ease and of knowing who I am that I feel here that I don't feel anywhere else," she says. "There's this entire web of people that I'm connected with, and I think that gives me a sense of myself that is hard for me to access when I'm not here. A way of understanding myself: who I am, and where I come from, and who I come from." The familiar southern Mississippi landscape feels like a part of her, too, with its snaking bayous and dense tangles of trees. "But," she continues, with a rueful laugh, "there's much I dislike about this place. I dislike the fact that I have to bear up under the weight of the history of this place, of the history of slavery and Jim Crow and sharecropping, the history of this place that made me." On a driving tour through DeLisle, we pass by small homes and rickety trailers set into the brush. "This is one of the black portions of DeLisle here," she points out. We pass her grandmother's house, where Jesmyn and 12 members of her extended family lived together for a time, crowded into four bedrooms. Ward's family has lived in DeLisle for generations, and it's where she sets her fiction, giving the town the name Bois Sauvage. Her characters are marginalized people — poor and black — who have always been seen as "worth less," she says. These are the people whose lives she brings to the page in stunning, sometimes brutal clarity. We sat in the open attic until the sky brightened from a sick orange to a clean white gray. We sat in the open attic until the water, which had milled like a boiling soup beneath us, receded inch by inch, back into the woods.... We were a pile of wet, cold branches, human debris in the middle of all of the rest of it. Ward was 34 when she won the National Book Award for Salvage the Bones. The novel had received scant reviews, and the award came as a surprise to many, including herself. She followed it with Men We Reaped, her memoir about five young black men in her community who died violent deaths. One of them was her younger brother Joshua, who was killed by a drunk driver at age 19. Telling their stories, she wrote, was "the hardest thing I've ever done. But my ghosts were once people, and I cannot forget that." Now, with Sing, Unburied, Sing, Ward has turned back to fiction. Her novel traces the twined narratives of a mixed race adolescent boy named Jojo, his drug-addicted mother, and the ghosts of those long dead who visit them. Ward sets some of the story in the 1940s in Mississippi's notorious Parchman penitentiary. "So much about that place reveals the essence of, the worst of Mississippi," Ward says. Parchman prisoners were treated like slaves: "They were worked and worked and worked and worked, and they were starved, and they were beaten. They were tortured." One of the ghost characters in Sing, Unburied, Sing is Richie, a boy who was imprisoned and brutalized at Parchman when he was just 12. "I thought, 'This person has to speak,'" Ward says. "'This person has to have agency, the kind of agency that they didn't have when they were alive.'" Writing Richie's story, Ward says, "almost feels like I'm righting a wrong, in a fictional way. I mean, this is like putting a Band-Aid over an amputation. I understand that this is a small remedy. But I think it is a remedy." At the local bookstore/cafe in neighboring Pass Christian, Ward now shares space on the shelves with fellow Mississippi writers such as William Faulkner and Eudora Welty. This year, Ward's portrait was added to the state's literary map, which strikes her as both thrilling and surreal. "In high school, I would look at that map," she says, "and here's Faulkner and here's Welty and here's Richard Wright, and I think a part of me always dreamed or asked, 'What if? What would it be like to be on that map one day?'" That "what if?" would have seemed a distant fantasy to Ward when she was growing up. Her father worked occasional factory jobs and raised pit bulls for dog fights. He left the family when Ward was young. Her mother worked as a maid, and at times relied on food stamps to help feed her children. Reading was Jesmyn's escape, and she was always drawn to books about spunky girls. She easily rattles off the titles that inspired her as a young reader: "Harriet the Spy, [From] The Mixed-Up Files of Mrs. Basil E. Frankweiler, The Secret Garden, The Hero and the Crown, Island of the Blue Dolphins, Julie of the Wolves, Pippi Longstocking." Ward wanted to see herself in those characters, but where those girls were bold adventurers, she was a painfully shy introvert. What's more, those characters didn't look like her: They were never black. "And that underlying message," she says, "that thing that I understood, was that stories about people like me, nobody wanted to read them, you know? Or that those stories weren't worth being told. Or that people like me weren't capable of being the hero." Ward's trajectory shifted unexpectedly when she was in middle school and got a life-changing opportunity. At the time, her mother worked as a maid for a wealthy white family in their mansion on the Gulf Coast, and they offered to pay the tuition for Jesmyn to go to a small, private Episcopal school. For years, she was the only black girl there. Ward went on to Stanford, becoming the first in her immediate family to go to college; there, she got her bachelor's and master's degrees in English and communication, respectively. She figured she needed to be practical, though, so a career as a writer was out of the question. "It made more sense for me to go to law school or go to nursing school and train myself for a profession where success was sort of guaranteed once you're done with the schooling," she recalls. But when her brother Joshua was killed, that changed everything. "I didn't have a choice anymore," she says. " I couldn't run from that desire to tell stories, that desire to tell stories about us, and about the people I loved. I couldn't run from it anymore. And it's not that I was confident that I could actually do it. You know, that didn't get me here! Confidence definitely did not get me here! More of like, desperation. And I thought, well, I can try. At the least I can try. And if I succeed, then I will have done something worthwhile with the time that I have been given." We've been talking in the room in her home where Ward writes ("I like to call it my library, but then that sounds pretentious," she says.) Its walls are painted a deep red ("my power color"), and it's filled with books, which spill off the shelves and are piled on the floor. At one point, her 4-year-old daughter Noemie bursts in, home from preschool, eager to show her mother her own work: She's learning how to write her name. "Look at that!" Ward says with clear pride, as she cradles her daughter on her lap. When Jesmyn Ward thinks about the future, she worries about what it might hold for her two young children, Noemie and 10-month-old Brando. She's especially unnerved by the recent violent rally staged by white supremacists in Charlottesville, Va.
"Part of me is panicking," she says,"thinking about my children and thinking about the place that I'm choosing to raise them in, and thinking about my brother, and wondering: Am I gonna be able to raise my children to adulthood? Are they gonna live to be adults, to be as old as I am now, in this climate, in this country?" These questions weigh heavily on Ward. She thinks about leaving the South, thinks about raising her children somewhere she feels lighter, where the weight of history isn't as oppressive. But the powerful tug of family keeps her rooted in Mississippi. Recently, Ward started work on a new novel. It's set in New Orleans during the height of the domestic slave trade, when enslaved people were packed into pens in the heart of the city as they waited to be sold. "It's really hard for me as a writer to sit with those characters who are living through that," she says. "It's really harrowing. And it's been very, very, very slow. If I can get a page out in a day, I am celebrating." When she first started writing the book, she was jolted to realize how little she knew about the history of the slave trade in New Orleans, a city just 60 miles away from her home and where she has spent a lot of time over the years. "I thought about all those people whose suffering had been erased," she says, "and I thought, 'Why can't they speak? Why can't I undo some of that erasure?'" Writer Jesmyn Ward calls Mississippi a place she loves and hates all at once. It's where she grew up and still lives in a tiny town by the Gulf Coast, a place where African-American families like hers are, she writes, pinioned beneath poverty and history and racism. And those struggles run all through her writing. 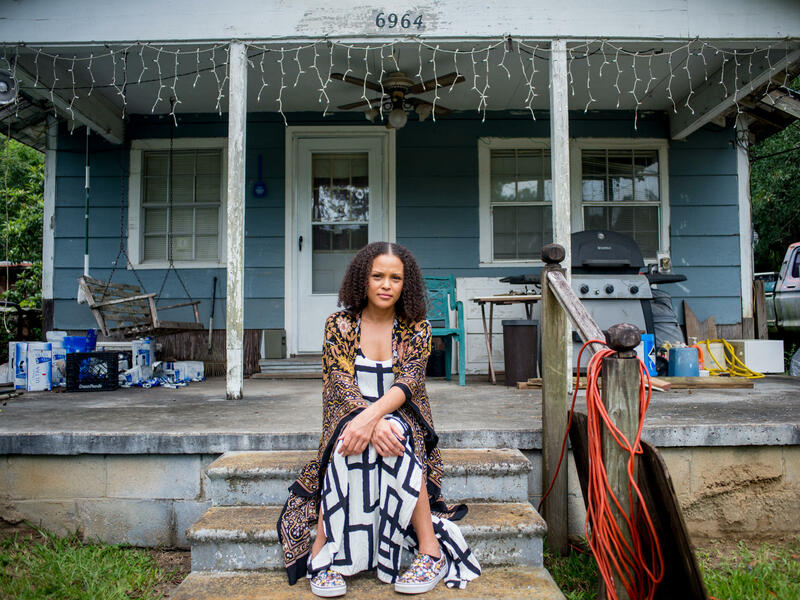 NPR's Melissa Block went to Mississippi to visit Jesmyn Ward at home. JESMYN WARD: Isn't it beautiful? MELISSA BLOCK, BYLINE: It is. We're driving over the bayou near Jesmyn Ward's hometown, DeLisle, Miss., the air summer-heavy and hot, the sky piled high with billowing clouds. BLOCK: This is the landscape Jesmyn Ward has known all her life. It's where her family has lived for generations. WARD: So this is the black - one of the black portions of DeLisle here. BLOCK: We pass small homes and rickety trailers set into the brush. We pass the field where she and her family rode out Hurricane Katrina in a pickup truck, watching the waters rise around them, feeling the wind rock them back and forth. WARD: There were six of us sandwiched into this pickup truck. Two of the people that were in that truck were, like, visibly elderly, right? And my sister was visibly pregnant. BLOCK: But they had to stay in the truck because the people whose land they were on wouldn't let them come into their house, said it was too full. WARD: They're white. We're black. And that's the only reason that I could think of. BLOCK: Jesmyn Ward's books are all set in this part of Mississippi, her characters poor and black, the people, she says, who've always been seen as worth less. These are the people whose lives she brings to the page in stunning, sometimes brutal clarity. In her novel "Salvage The Bones," it's a family barely surviving the wrath of Katrina. WARD: (Reading) We sat in the open attic until the sky brightened from a sick orange to a clean, white gray. We sat in the open attic until the water, which had milled like a boiling soup beneath us, receded inch by inch back into the woods. BLOCK: "Salvage The Bones" won her a National Book Award in 2011 when she was 34, a surprise to many, including Ward herself. She followed it with a searing memoir, "Men We Reaped," about five young black men in her community who died violent deaths. Now she's turned back to fiction with a new novel titled "Sing, Unburied, Sing." We'll talk more about that in a few minutes. 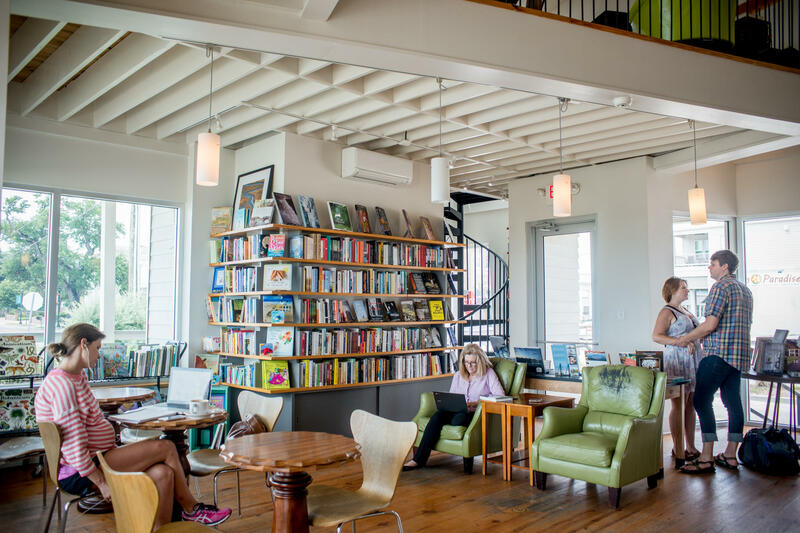 We stop by the local bookstore cafe in nearby Pass Christian, where Jesmyn Ward shares space on the shelves with fellow Mississippi writers like William Faulkner and Eudora Welty. And this year, her portrait was added to a poster, the state's official literary map. WARD: Yeah, I made the map. You know, in high school I would look at that map, you know? And here's Faulkner. And here's Welty. And here's Richard Wright. And I think a part of me sort of always dreamed or asked, you know, like, what if? You know, what would it be like to be on that map one day? BLOCK: That what if would have seemed like a distant fantasy to Jesmyn growing up. WARD: You know, we were poor. BLOCK: Her father worked occasional factory jobs and raised pit bulls for dogfights. He left the family when Jesmyn was young. Her mother worked as a maid and at times relied on food stamps to help feed her children. They lived in a single-wide trailer. Later they moved in with extended family, 13 of them packed into her grandmother's house. For Jesmyn, reading was her escape, especially books about spunky girls. WARD: "Harriet The Spy," "The Mixed-Up Files Of Mrs. Basil E. Frankweiler," "The Secret Garden," "Island Of The Blue Dolphins," "Julie Of The Wolves," "Pippi Longstocking." BLOCK: Did you see yourself in them? WARD: I think I wanted to see myself in them. BLOCK: But those girls were bold adventurers. Jesmyn was painfully shy. And those characters didn't look like her. They were never black. WARD: And that underlying message, that thing that I understood, was that stories about people like me, like, nobody wanted to read them, you know? Or that those stories weren't worth being told. Or that people like me weren't capable of being the hero. BLOCK: In middle school, Jesmyn got an unexpected opportunity. Her mother was working as a maid for a wealthy white family in their mansion on the Gulf Coast, and they offered to pay the tuition for Jesmyn to go to a small private Episcopal school. For years she was the only black girl there. She went on to Stanford - the first in her immediate family to go to college - got her bachelor's and master's degrees in English and communication respectively. But she figured she needed to be practical, so a career as a writer was out of the question. WARD: You know, it made more sense for me to go to law school or go to nursing school and train myself for a profession where success was sort of guaranteed. But I - but my brother died, and I didn't have a choice anymore. BLOCK: That was Jesmyn's younger brother, Joshua, killed by a drunk driver when he was 19. WARD: You know, like, I couldn't run from that desire to tell stories, that desire to tell stories about us and about the people I loved. And it's not that I was confident that I could actually do it. You know, that didn't get me here. Confidence definitely did not get me here. More of like a desperation, right? And I thought, well, like, I can try. At the least I can try. BLOCK: We've been talking in the room where Jesmyn Ward writes. It's painted a deep red. Her power color, she says. WARD: I like to call it my library, but then that sounds pretentious. BLOCK: Books everywhere, spilling off the shelves and piled on the floor. Here she wrote her new novel, "Sing, Unburied, Sing." It traces the twined narratives of a mixed-race adolescent boy named Jojo, his drug-addicted mother and the ghosts of those long dead who visit them. Ward set some of the story in the 1940s in Mississippi's notorious Parchman penitentiary. WARD: So much about that place reveals, like, the essence of the worst of Mississippi. They were treated as slaves were. I mean, they were worked and worked and worked and worked. They were starved and they were beaten. You know, they were tortured. BLOCK: Ward tells me the weight of history in the South of slavery and Jim Crow makes it hard to bear up. And when she thinks about the future, she worries - worries about climate change and more devastating storms like Katrina and Harvey that she fears could erase her town, DeLisle, from the map. And she worries about her two young children - Noemie, who's nearly 5, and 10-month-old Brando. She was especially unnerved by the recent violent rallies staged by white supremacists in Charlottesville, Va.
WARD: Part of me is panicking thinking about my children and thinking about the place that I'm choosing to raise them in and thinking about my brother and wondering, am I going to be able to, like, raise my children to adulthood? Like, are they going to live to be adults, to be as old as I am now in this climate, in this country? That's Noemie. BLOCK: Suddenly, as we're talking, the door bursts open. BLOCK: And Noemie rushes in, home from preschool, eager to show her mother the writer her own work. She's learning to write her name. WARD: Oh, look at that. Look at that. You made an M.
BLOCK: Melissa Block, NPR News, DeLisle, Miss. WARD: You got all the letters. They're a little out of order, but we'll work on that. Transcript provided by NPR, Copyright NPR.